Side-effects are the unintended consequence of therapeutic treatments, but they can also be seen as valuable read-outs of drug effects in humans; these effects are difficult to infer or predict from pre-clinical models. Indeed, some studies suggest that drugs with similar side-effect profiles may also share therapeutic properties through related mechanisms of action. A recent publication exploits this concept to systematically investigate new indications for already marketed drugs, and presents a strategy to get the most out of the tiny portion of chemicals that have proved to be effective and safe. For almost a century, drug discovery was driven by the quest for magic bullets, which act by targeting one critical step in a disease process and elicit a cure with few other consequences. However, this concept is far from biological reality, and even the most successful rationally designed drugs (such as Gleevec®) show a quite promiscuous binding behavior, which has opened novel therapeutic possibilities . Today, the emerging picture is that drugs rarely bind specifically to a single target, and this challenges the concept of a magic bullet. Indeed, recent analyses of drug and drug-target networks show a rich pattern of interactions among drugs and their targets, where drugs acting on a single target seem to be the exception. Likewise, many proteins are targeted by several drugs with quite distinct chemical structures . 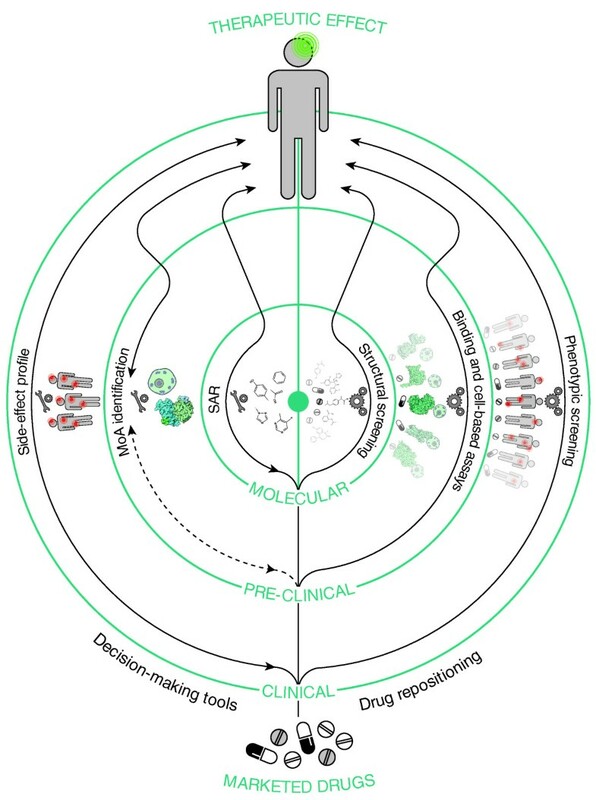 Drug-repositioning strategies seek to exploit the notion of polypharmacology , together with the high connectivity among apparently unrelated cellular processes, to identify new therapeutic uses for already approved drugs. The main advantage of this approach is that, since it starts from approved compounds with well-characterized pharmacology and safety profiles, it should drastically reduce the risk of attrition in clinical phases. There are several successful examples of drug repositioning (for example, thalidomide to treat leprosy or finasteride for the prevention of baldness), although they were all found by serendipity and are not the result of well-thought strategies. More recently, and following the observation that most novel entities are found by phenotypic profiling techniques , systematic initiatives to find new indications for old drugs have flourished. These approaches rely mostly on genome-wide transcriptional expression data from cultured human cells treated with small molecules, and pattern-matching algorithms to discover functional connections between drugs, genes and diseases through concerted gene-expression changes . However, unfortunately, pre-clinical outcomes often do not correlate with therapeutic efficacy; only approximately 30% of the compounds that work well in cell assays work in animal models and, of these, only 5% work in humans . Being aware of the efficacy gap between pre-clinical and clinical outcomes, Bork and collaborators presented, in 2008, a strategy to link precise molecular data with phenotypic observations . In their seminal work, they established and catalogued the relationship between drugs and side-effects observed in clinical phases, and exploited this information to identify shared target proteins between chemically dissimilar drugs . Sharan and colleagues  built on these molecule-phenotype relationships to develop drug-drug and disease-disease similarity measures that they used to train a machine learning algorithm for inferring novel indications to drugs under development, with potential applications in future personalized medicine. In a recent article published in PLoS ONE, Yang and Agarwal  present a computational method that systematically explores novel potential applications of already marketed drugs in distinct therapeutic areas (for example, suggesting an antidiabetic effect for an anticonvulsant drug). The rationale behind their approach is that drugs sharing a significant number of side-effects should also have, to some extent, a common mechanism of action. In a way, the side-effect becomes a type of phenotypic biomarker for each particular disease. The authors then compiled a list of all known drug-disease and drug-side-effect relationships to build disease-specific side-effect profiles and explored the possibility of using these links as hints to suggest novel indications for drugs sharing the same profiles, but prescribed within different therapeutic areas. Approximately 4% of the 84,680 disease-side-effect associations investigated (that is, 145 diseases and 584 side-effects) were found to be informative, and some handpicked examples indicate a common mechanism of action for the drugs with similar side-effect profiles. The approach has also been used to predict safety indications and suggest mechanisms of action for compounds in clinical development phases. In this case, because the precise safety indications are far less clear, the method had to predict side-effect profiles for each novel compound with a structure-activity relationship approach, including an extra level of uncertainty. As expected, the applicability and accuracy observed in this case are lower than those achieved for marketed drugs with more precise side-effect information. Fifty years ago, drug discovery was mostly driven by the phenotypical response to the assayed molecules observed in animal models. However, in the early 1980s, owing to the success of molecular biology, the criteria for evaluating the potential of a novel compound shifted from a strict physiological observation to a molecular one, where the best lead chemicals were those that bound strongly to the target protein and had a good specificity profile. Retrospectively, in most cases this selection strategy was an enormous mistake, because it attempts to predict the behavior of a complex system, with many and varied emerging properties at each level (that is, molecular, cellular and systemic) from its constituent components in isolation. As a shortcut to bridge molecular and clinical observations, many cell-based and functional assays in animal models have been developed, but unfortunately making inferences from one complexity level to another is often inaccurate, as shown by the attrition rates in drug discovery pipelines . Analogously, repositioning strategies that rely on chemical structures of drugs (that is, molecular level), or their protein targets and cellular responses (that is, pre-clinical level) are also bound to suffer from the same problems (Figure 1). The drug repositioning strategy presented by Yang and Argawal  is almost exclusively based on clinical observations, without relying on data collected in different complexity levels, and thus should be able to overcome some of these limitations. Bridging the levels of biological complexity. The left half of the scheme represents the association between drugs and their therapeutic effects measured with different assays. Captured biological complexity increases radially and, in principle, inner knowledge can be gained indirectly. Side-effects are on the outer level and constitute a signal of similar complexity to the therapeutic effect. Pre-clinical experiments such as disease-gene associations or gene-expression profiles provide biomolecular rationale for a disease, but the underlying mechanism of action (MoA) upon treatment can only be proposed as a complement. Finally, a structure-activity relationship (SAR) does not embrace biological understanding because the therapeutic outcome is ciphered within the molecular structure alone. All this information is used in the right half to guide drug repositioning, where candidates are screened correspondingly. Arrows crossing biological complexity levels imply functional inferences not necessarily supported by the assay design. Although the idea of using drug-specific side-effect profiles to suggest novel indications, as shown by Yang and Agarwal, presents an attractive alternative to skip the uncertainties of traveling between molecular and clinical observations, there are several aspects that new implementations will have to address. The most important one is, undoubtedly, the need to consider the expected different frequencies of therapeutic and adverse effects in the population. Whereas therapeutic effects are supposedly the result of interfering with molecules or processes central to the pathological process and common to most individuals, adverse effects affect only a small fraction of the population. This could be related to the doses or the modes of administration of the drugs considered, in which case the issue could be easily addressed, although higher doses or a distinct formulation might also elicit novel undesired effects. However, some side-effects are possibly caused non-specifically by the chemical compound itself, or its degradation by-products, independently of any mechanism of action or the targets it binds, hampering the main hypothesis behind the study. Future improvements of the method should focus on those side-effects directly related to target proteins shared between the therapeutic indication and the side-effect, and will profit from the availability of information about doses, biodisponibility, and so on, to investigate further whether the mechanism of action is indeed the same, and would certainly improve the accuracy of the predictions. Given the crisis in the pharmaceutical industry arising from the lack of new molecules, drug repositioning seems a valid option to get the most out of the safe compounds that are already approved, and novel strategies to search rationally for new indications for old drugs are already flourishing. However, all current approaches rely on a very limited set of data available for a few hundreds of compounds on the market, and would greatly benefit from the vast amount of clinical data accumulated by the pharmaceutical industry in pre-clinical and clinical phases. We understand their fear that releasing these data could reveal unexpected side-effects for approved or experimental products, but it could also provide interesting opportunities to rescue abandoned compounds that showed low efficacy in clinical trials. It is worth trying! This work was partially supported by the Spanish Ministerio de Ciencia e Innovación (BIO2010-22073) and the European Commission under FP7 Grant Agreement 223101 (AntiPathoGN).